I’m with you. It’s also a little more secure. I broke a digital camera last year by carrying something heavy in and resting it on my leg as I opened the door. You’re less likely to break stuff up high. I didn’t even know it had a name. There’s a Napoleon pocket on my Lippi Jacket (it’s a Chilean company) and I find it great for slipping in an ATM card/some money for a quick trip to the shop, rather than carry a wallet. And also for an ipod shuffle. LL Bean fleeces have this now too… very nice. 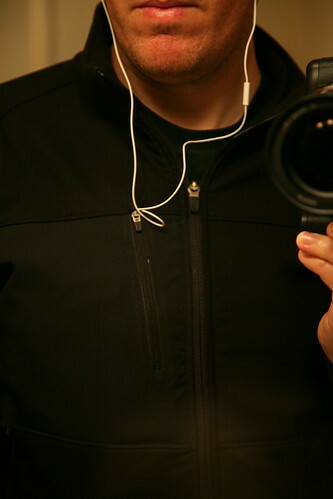 I dunno if your jacket has this, but some of the cool new shells from REI have not only a napoleon pocket, but a special headphone conduit that pokes through to the inner lining of the jacket itself so you can run the wires up underneath the jacket / hood. It’s perfect for wet weather. Intriguing. Any particular garments you’d recommend with this feature? They are very useful when wearing items like snow-pants or heavy layers when you donâ€™t have your regular pocket situation. Oh yeah, I forgot about snowboarding. They’re awesome for stashing a few bucks and being able to buy lunch easily without having to dig around in zippered pants pockets. Any particular garments youâ€™d recommend with this feature? In the photo above, I’m wearing a REI One jacket I got for xmas. It’s a great simple jacket but kind of expensive. A lot of hiking/outdoorsy jackets are starting to feature this so I’d say visit a REI store. I like the inside vest pocket for the same reason…great for iPods and weird extra stuff you need to haul around. I don’t know what I’m going to do this summer when it’s too warm to wear a jacket as I’m getting daily use out of this feature. Someone want to whip Matt up a t-shirt with a Napoleon pocket? Maybe get a windshirt from Montane, Marmot, Patagonia, OR, GoLite, etc. They’re thinner and lighter than the softshell you’ve got in the photo (usually 3-5oz). A lot of them have full zips and Napoleon pockets. May not take you into deep summer, but certainly further in to spring and fall. I am a complete Napoleon pocket fanboy too. I rather wish garments were made to have two or even four of them. They are very useful when wearing items like snow-pants or heavy layers when you don’t have your regular pocket situation. This pocket. Headphone channels. About 2 dozen other pockets (from 2 tiny earbud stashes to the entire back of the coat with a Camelbak reservoir and hose channel) and more features than I have figured out yet. Check out the Scott eVest. Too bad I live in the tropics, where jackets are as useful as a Zamboni on our roads. Someone definitely come out with the Nap pocket t-shirt. The iPhone is partly one of the reasons I’ve switched to shirts with breast pockets. But still, a typical breast pocket doesn’t have enough room for the iPhone without the risk of slipping over. This sounds like the best compromise. Gary you worry me. You think far too much about these things. That said, I use my napoleon pocket all the time, but find it’s really only big enough for a nano-pod. Anything heavier ruins the line (unless your jacket is usually zipped up).